In Search of Mayberry | Small town life and the importance of The Andy Griffith Show. 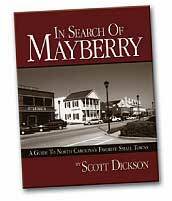 While Andy Griffith may have created the mythical town of Mayberry, North Carolina for his television show, it may not actually be 100% make-believe. The small, sleepy little town, full of extremely nice people and memorable characters is a legacy that North Carolina and its people will probably never forget. In fact, most North Carolinians embrace the show and the fact that it is most likely based on Mount Airy, NC. Andy Griffith is the state’s favorite son, and the town portrayed in the show is just as much a part of North Carolina as ACC Basketball, the Carolina Panthers, Grandfather Mountain, or the Cape Hatteras Lighthouse. Volume 2 is in the works. “Mayberry in the Mountains” will explore small towns in the mountains of North Carolina.